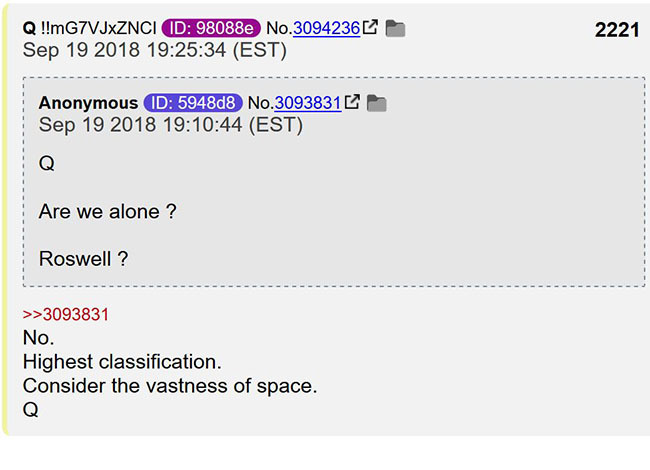 Perhaps anticipating skepticism, Q further advocates that readers consider the vastness of space to realize that our galaxy, and the universe more generally, is certain to be teeming with life, some of which have technologically evolved sufficiently to travel through our galaxy and visit the Earth as occurred with the Roswell incident. 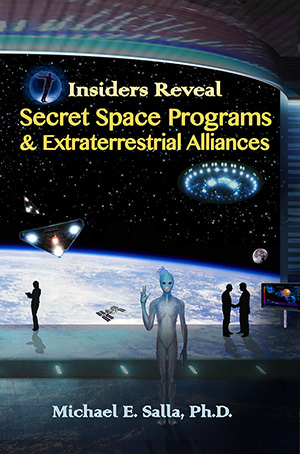 Two insiders, Emery Smith and Corey Goode have recently spoken about how corporations are in charge of secret space related programs run out of military installations such as Kirtland Air Force Base. 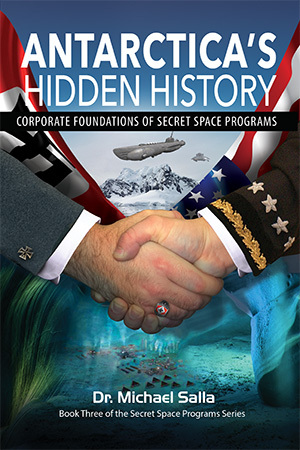 In the book, Antarctica’s Hidden History and the Corporate Foundations of Secret Space Program, the historical genesis of corporate control over space programs is described in detail. While Q did not explicitly refer to President Donald Trump’s Space Force initiative, it can be inferred from Q’s reply that this is related to the existence of secret space programs. This is the first time that Q has explicitly referred to secret space programs. Previously, Q posts have alluded to a secret space program being involved in intercepting a ballistic missile attack on Hawaii. 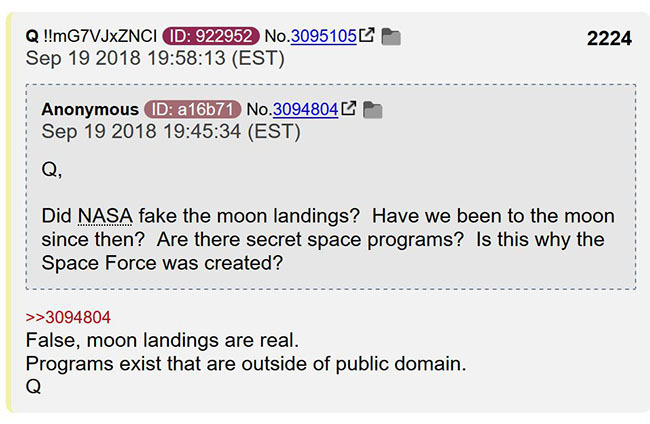 In can be expected that Q will reveal much more as the general public becomes open to the possibility that the truth about secret space programs and extraterrestrial life has been hidden, and the Space Force initiative becomes a means of wresting control away from corporations and back into Presidential Executive control. I was surprised when I read on another pro Q site that stated many Anons were shocked about Q confirming that ET’s exist. Those are supposed to be well read people who are savvy about many things. To those of us who have been researching these topics for decades this comes as a sort of yawn and verification from another source. What surprises me to this day is how many who are fairly intelligent about these topics still underestimate the importance of understanding why our moon does NOT spin on it’s axis. All natural object within the known universe spin on their axis. All galaxies, stars, planets and moons spin on their axis because of what is known as gravitational Torsion waves that emminate from the central cores of galaxies as well as from stars and planets. So why doesn’t our moon spin when these Torsion waves guarantees they should? Because everything researched about our moon points to one obvious direction. Which is that the moon is an artificial construct and not a natural satellite. If the satellites we send into orbit around our planet spun on their axis they wouldn’t work, right? Same thing for the moon. What’s up,I read your blog named “Q Confirms Secret Space Programs Real & Extraterrestrial Life Exists | regularly.Your writing style is awesome, keep doing what you’re doing! And you can look our website about ظ…ظ„طھظٹ ظ…ط§ظƒط§ â€“ Multi-maca ظ…ظ†ط´ط· ط¬ظ†ط³ظٹ ط·ط¨ظٹط¹ظٹ ظ„ظ„ط±ط¬ط§ظ„ ظˆط§ظ„ظ†ط³ط§ط،.